We spent a few minutes talking one on one with the Governor's creepy little cream-suited scientist from The Walking Dead. 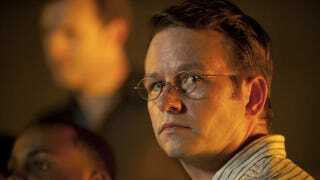 Dallas Roberts, who plays the optimistic Milton Mamet, gave us a new look into the life of Woodbury's resident lab rat. Find out who the Governor would choose if he had to pick between Milton and Merle, and just how deep Milton's love for his leader goes. What's Milton's backstory? What do you know about him? Dallas Roberts: No, they didn't give me anything but a script. And that was script one. He does X and he does Y, and that's a little piece of Milton. And you sort of fill in the spaces the best you can. And then you get the next script and he does X and Y there, and you begin to see he has other things going on. It's really been like Dungeons and Dragons, as you turn the corner, then you can see a little bit more of the maze. That's what the experience has been like. It was really just find your seat and start running. How did you begin shaping this character, what don't we know about Milton? He's really become a character that I'm quite fond of. I enjoy his perspective. I enjoy the differences between his perspective and myself, as a person. And the differences between his perspective and other characters' perspective, it's been one of the fun ones to do for sure. If the Governor had to choose between Milton and Merle, who would he choose and why? If he was wise he would choose Milton. I think the Governor's got no problem when it comes to might. And the Governor's got no problem when it comes to brain power, either. But If it were me, I would choose Milton every day. What is Woodbury in real life? It's an actual town. It's an actual main street of an actual town. Instead of a production town, where you walk behind a building and there's a bunch of wood holding up a wall, it's all real. There's actual fire hydrants, actual streets. That has been a lot of fun, and then the world that the writers created inside of that has been extraordinary as well. When you all went to pick up Walkers, Milton was very interested in certain types of Walkers. What does he have going on, on the side? Milton, I think, in episode five he's trying to get to the heart of what's going on. And part of the reason of collecting the Walkers is to engage them in this gladiator arena. But Milton has his own desires, and is collecting specimens for study. What makes Milton qualified to study the Walkers? That's the thing about the apocalypse, you don't know anyone's backstory. Milton could be insane and lying about his skills? Is he even qualified to do this? I think he's the most qualified of all the candidates, and I think he's in way over his head. He certainly doesn't have the most sophisticated equipment. He's lacking a big source of electricity. He's got a hard row to hoe for sure. But he's definitely the most qualified there. Now whether or not he's pretending to be a scientist remains to be seen. I think the character Milton was loosely based off was a doctor in the Governor's town who followed Rick back to his crew in hopes of helping Lori deliver the baby. He doesn't survive the trip — so were you nervous about taking on a character with a death sentence? Did you read the comics? Number one, I have read the comics. Number two, if you are a fan of the comics and you get a job on The Walking Dead and you're not Michonne, Rick or Andrea (Milton just doesn't exist in the comics) you try and figure out, "Oh, am I amalgam of this character and this character in the comics?" And you sort of tie yourself in knots trying to figure that out. But as soon as you show up on the set of The Walking Dead, you're just asking yourself how much time am I going to get before it's all over? I imagine that's what it's like to be on Boardwalk Empire or The Sopranos, they're coming for ya. Does Milton know about the Governor's TVs and his daughter? Yes. Milton knows. Milton takes the good with the bad. He doesn't approve, necessarily, but he's certainly not in a position to challenge it. People are complicated... the Governor's really complicated. But people are complicated, if you love someone — [and] it's a purely platonic love — you learn to accept the parts about them that you don't understand. The Governor doesn't make it easy, but Milton tries his hardest. Is Milton a brave man? Brave? Yeah? I think Milton's bravery is less sort of riding out on the back of his own machine gun and more, "I'm not going out, this thing can be reversed if we get enough information." He's a survivor. Any survivor by necessity is brave. One of the fun thing about Romero's early zombie movies was the underlying themes about capitalism. Have you thought about the themes of Woodury and how they apply to society? I think one of Milton's feelings is that he needs a form of society, however fractured it is. He needs that form of civilization in order to carry out his work. And in order to get that level of civilization he understands that out there on the edges, dark things are happening. People are losing family and their lives. It's not a utopia by any stretch of the imagination. And I am unabashedly really excited about the events of our recent election. But I know on the outside edge there's drones dropping bombs out there. And that's not something that I'm sort of comfortable with either. That notion and that sort of timeliness of this resinates with me, for sure. Could Milton survive without Woodbury? I think if he made it, it would be more stealth than anything else. I think his proximity to the Governor has allowed him to not have to develop the skills the hand to hand combat skills, or picking up a weapon. He's been pretty sheltered from that. So it would be interesting to see what would happen without that protection. Do you think if the Governor fell, Milton would be desperate to join Rick's group? I think, like anyone would in the situation, you do what you have to do to keep breathing. And keep living. If a better opportunity presented itself in terms of survival, I think anyone would react similarly. You're going to choose life most of the time. But he's smart enough to put duct tape on his jacket, so he's got that going for him. Yeah... Duct Tape, y'all. Works for everything.